Whether you call them a custard apple, poor man’s banana, Quaker delight, or Hoosier banana, one thing is for sure, the fruit enjoyed for centuries by Native Americans is both healthy, nutritious, and very good for us. Pawpaws contain three times as much vitamin C as an apple, twice the niacin and riboflavin as an orange, and about the same potassium as a banana. They are also high in magnesium, iron, manganese, copper, and several essential amino acids. And the big bonus is they’re delicious! The pawpaw is the largest edible tree fruit native to North America and indigenous to the temperate woodlands of the eastern United States. Thanks to the American Indian, the pawpaw spread as far west as eastern Nebraska, Kansas, and Texas; from the Gulf Coast to the Great Lakes. 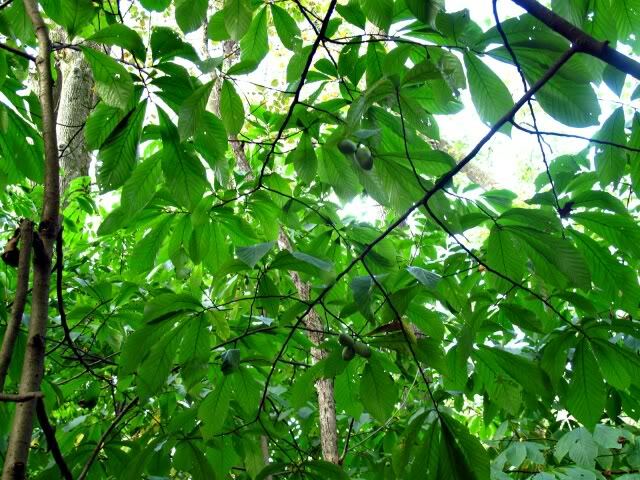 The first documentation of the pawpaw is found in the 1541 journals of Spanish explorer, Hernando de Soto, who found Native Americans eating and cultivating them east of the Mississippi River. Later in 1787, the journal of Major Benjamin Sites, founder of Columbia, Ohio, describes he and a company of twenty-six settlers clearing a pawpaw thicket to build a blockhouse. Accounts of the Lewis and Clark Expedition make numerous mention of their fondness for, and dependency on, this native fruit. 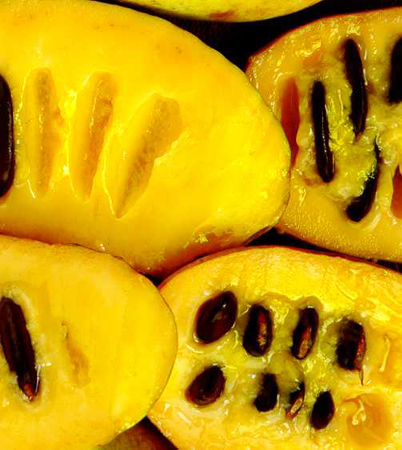 George Washington’s favorite dessert was chilled pawpaw fruit, and Thomas Jefferson cultivated them at Monticello. The pawpaw is a yellowish-green, oblong fruit, with brown or black splotches, about six inches in length, and weighing about eight ounces. The complex flavor of its sweet, custardy, bright yellow flesh has overtones of mango, banana, and pineapple. Some with a melon-like aftertaste. It’s been said that the pawpaw is best when eaten immediately after picking since they have a shelf-life of only a few days. But the pulp can be used to prepare a number of tasty treats–from pies, breads, and custards to sauces, brandy, and beer. Since the early 1900s, there have been fierce competitions for selecting the largest and best tasting pawpaw. The first of these contests occurred in 1917 where the winning entry out of seventy competitors received a $100 prize. The largest pawpaw ever recorded was grown in Athens, Ohio and measured eighteen inches in diameter. Today, the Ohio’s Hill Country Heritage Area Program sponsors an annual Ohio Pawpaw Festival at scenic Lake Snowden in Albany, Ohio, featuring three fun filled days of music, food, contests, art, workshops, and other events for young and old alike. Although there is renewed interest in their development, large-scale production of pawpaws has not been successful, because the fruit is easily bruised, highly perishable, and does not ship well. The season for pawpaw fruit is typically late August through September. If you are fortunate to be in Ohio or Kentucky (or another state in which the fruit grows) during that time of the year, you can likely find pawpaws in local farmers’ markets or you can forage your own. Others can purchase fruit or pulp online. Probably the most perfect rendition of street food ever created in this nation is the humble corn dog. After all, what could be more convenient to someone taking a stroll than a wiener impaled on a stick, dipped into a thick batter, and deep fried? 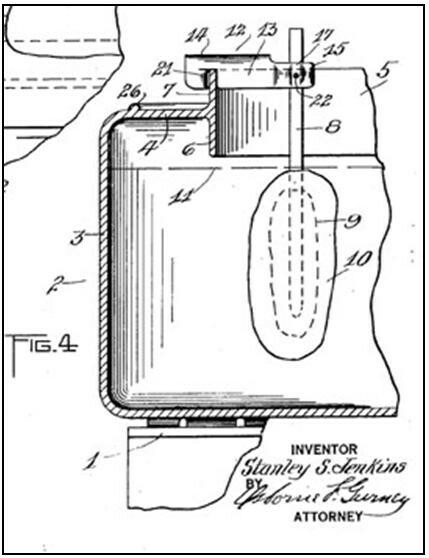 The origin for this all-American fast food dates back to the early 1900s when the Wagner Manufacturing Company of Sidney, Ohio created a product they called the “Krusty Korn Sausage Pan.” In marketing their new appliance, Wagner advertised that the popular combination of cornbread and sausage could “be baked together as a full ear of crusty cornbread with a sausage inside.” Then in 1929, the Albert Pick-Barth catalog of food equipment and supplies offered a “Krusty Korn Dog” baker, obviously the Wagner product renamed since “Krusty Korn” was one of their trademarks. 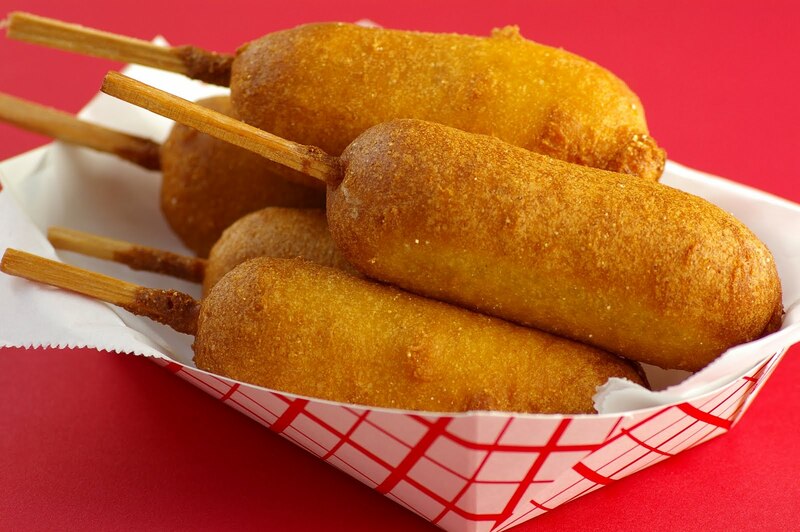 It wasn’t until the 1940s that corn dogs started gaining national popularity. In 1941, George and Vera Boyington began serving Pronto Pups, a plump, tasty hot dog on a stick, dipped in a special batter and deep-fried, at their Portland, Oregon restaurant. That September, they sold over 15,000 Pronto Pups at the Pacific International Livestock Exposition. By the summer of next year, Carl and Neil Fletcher, who had experienced the hot dog encased in cornmeal and baked in the shape of an ear of corn while traveling the vaudeville circuit, opened their food booth on the Fair Park midway. They sold their “corny dogs” for fifteen-cents and, despite a slow start, made 8,000 dollars that first year. 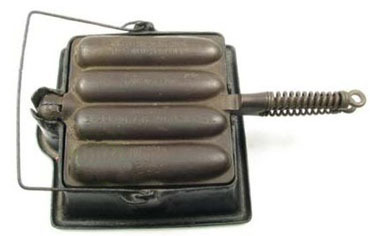 In June of 1946, following World War II, Ed Waldmire Jr. began selling his version of the hotdog on a stick (he originally called it a “crusty cur”) at his Cozy Dog House in Springfield, Illinois, based on a similar product he came upon in Muskogee, Oklahoma. The business grew quickly and Ed built his third location in as many years, the Cozy Dog Drive In on Route 66. Today, corn dogs can be found worldwide, albeit by different names. In Canada, they are known as Pogo Sticks, and in Australia as Dagwood Dogs, Pluto Pups or Dippy Dogs. Argentina refers to them as “panchuckers” that are sold mostly around train stations and the inner country cities. Corn dog variations are as numerous as the places in which they are sold. Some are made with wieners, breakfast sausages, bratwurst, red-hots, and some with no meat at all. Some use wheat flour or potato-based coatings instead of cornmeal based batters. You don’t have to wait for the fair, circus, or ball park to open before enjoying this tasty treat. You can simply pick up a box of frozen corn dogs from almost any local supermarket or convenience store, pop them into your conventional or microwave oven, heat, and enjoy. Those more adventurous readers who like futzing around in the kitchen are sure to enjoy one of the corn dog recipes listed below. So whether you live in the North, South, East or West; buy them, heat them, or make them from scratch; slather them in mustard, ketchup, or a secret dipping sauce, these wieners on a stick are certainly the most DOG-gone convenient and delicious street food found anywhere.